Gateway Mall now has 95,000 square feet available to lease. Gateway is a shell of its former self, as the cannibalization of its best tenants by the City Creek Center is now nearly complete. The fountains at City Creek rise in triumph much taller than the Gateway Olympic Legacy Fountain. The Gateway was the epicenter of the 2002 Games. The Olympics were considered a crowning achievement, focusing world recognition on the growing mainstream nature of the Church of Jesus Christ of Latter-Day Saints. Remember the attention? Mitt Romney became a rising star and media darling. 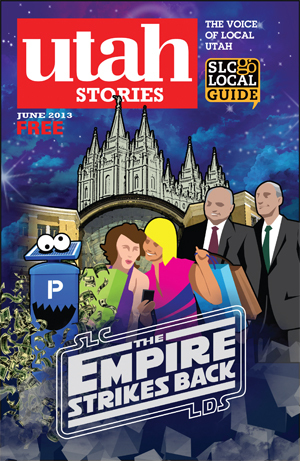 Katie Couric and Matt Lauer presented stories about the missionaries, Mormons and Temple Square. But the real legacy of the Gateway wasn’t so much the Olympics as the harm it caused to the failing Crossroads Mall and ZCMI Center. Blight across the street from Temple Square didn’t jive with the Church powers. Something big had to be done. The Church’s for-profit arm, Zion Securities, stepped in to the tune of $2 billion to reclaim retail power. The Empire struck back. 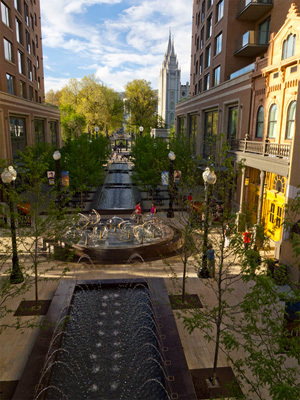 The City Creek Center is Zion Securities’ new crown jewel, but to ensure economic success, they worked in partnership with the publicly-traded Taubman Partners. But is this a partnership that the pioneers would be proud of? I think not. When the Mormon pioneers arrived the Salt Lake Valley they suffered from a lack of basic necessities: horseshoes, lumber, nails, string, sugar and fabric, as well as a dearth of currency due to their reliance on imports. Brigham Young decided to continue Joseph Smith’s vision and build the Kingdom of Deseret as a self-sufficient economic theocracy. The Saints survived by enacting the “United Order.” Land and surplus crops were shared. Labor became plentiful due to the brilliant concept of the Perpetual Emigrating Fund. 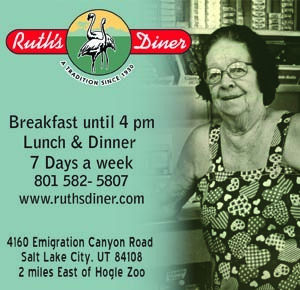 The PEF provided a means for Europeans to relocate to Salt Lake and furnish the new immigrants land, food, housing and a job once they landed. LDS missionaries proved very successful in converting European Protestants and Anglicans to Mormonism with the promise to build the Kingdom of God on Earth. Over the course of ten years, the PEF lent $8 million to relocate over 50,000 converts from Europe to the Great Basin. The vision of the Great Basin Kingdom operated under a different set of values concerning every aspect of life: political, economic and religious. The overall goal was to offer an alternative to governmental and industrialist control. All over Europe, cities were building wealth, but they were fueled by sweat shops and factories that drained a person’s life and spirit. The Kingdom the Saints imagined was built on an economic model which promoted farmers, families and tradespeople working together in a tightly woven interdependent web— self-sufficient from the outside world and “their enemies.” Mormons were the “yeoman farmers” of Jeffersonian democracy who believed each man and woman possessing a trade, skill or farm could work together in harmony under a highly efficient theocracy. This system relied not only on a very skilled workforce but also on careful and organized exploitation of the natural resources of the Great Basin area. Brigham Young announced “callings” for families to colonize areas such as Cedar City in order to mine coal and iron ore to fabricate nails and horseshoes. Missionaries were sent to France to buy machinery to extract sugar from beets so that the city need not rely upon imported sugar. Always the agricultural innovator, Young even sent a group of farmers to Southern Utah and Nevada to raise cotton, tobacco, wine, figs and tropical crops. The early Saints Relief Societies invested in a silk worm cocoonery operated by women. 96 boot and shoe makers came, 12 cabinet makers, 46 engineers, 2 ironmongers, 226 miners, 73 masons, 8 printers, 22 spinners, 9 weavers, were all recruited from Europe to join the Saints in building the Kingdom. Some ventures succeeded, others failed. The silkworm operation flourished for a period; the Provo Woolen Mills Cooperatives were amazingly successful and produced a surplus of fabric to export. The wine and molasses produced in Southern Utah fed the otherwise starving colony, which struggled for years to produce a productive amount of cotton or tobacco. Overall, due to their cohesion persistence and skilled workforce, the experiment was a success. 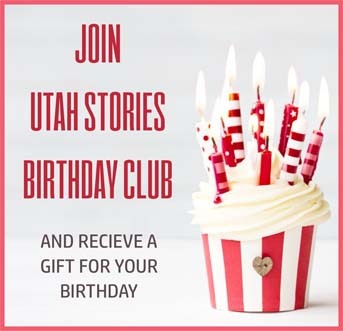 By the 1860s a new idea was initiated to have the cooperatives feed into the general cooperative called ZCMI, which eventually had retail stores in 90 Mormon towns. ZCMI was the nation’s first chain store. But its chains were links that supported and sustained small towns and tradespeople, local industry and farmers. It could be argued that ZCMI’s success was largely due to LDS cohesion and Brigham Young and George Q. Cannon’s economic control. Young commanded members to shop at ZCMI or suffer shame for supporting the “gentile merchants” or “their enemies” who were settling in the area and removing much of the cash-flow from the pioneer economy. ZCMI’s tight web and strong labor force made Pioneer unemployment was virtually non-existent and it proved a highly effective method to quickly build the strong and wealthy Kingdom Young envisioned. Young initiated this bold economic experiment due to currency shortages that pioneers were constantly battling. Initially the timing of Mormon pioneers in the Salt Lake Valley proved advantageous. Settling in 1848 was extremely difficult and fraught with heartbreaking stories, but by 1851 a steady influx of gold-prospecting migrants was traveling through the valley to San Francisco. Traveling prospectors paid up to $5 per pound for flour (more than ten times the regular price). Milk, eggs and beef all fetched enormous prices, which fed much needed cash into the pioneer economy. Yet currency exited the economy nearly as fast as it entered. Merchant wagon trains would enter the valley selling the basic goods pioneers needed as well as many things they didn’t; coffee, tea, tobacco, liquor, dresses and overalls were all sold for cash. Wagon trains entered the valley with thousands of dollars of goods and they only accepted gold and silver coins for payment. Then the “money grubbers” as Young called them exited with their wagons full of much needed currency. The result was the Saints would have little or no cash for tithing and instead tithed with their farm animals, grains and vegetables. The answer to the currency outflow problem was to call on the Saints to “support home industry.” More than just a suggestion, a virtual boycott was ordered by Young. Rather than fight a retail battle they knew they couldn’t win, successful gentile retailers offered to sell their operations to the Church. Both Walker Brothers and Auerbach Brothers believed themselves doomed to fail without the support of the LDS. The savior of the “gentile” retail operations was the steady increase of both Mormon and non-Mormon settlers. Main Street became divided between the “gentile area” (non-Mormon) and the Saint’s area which was in closer proximity to the Temple and in and around ZCMI. This “Great Divide” remained downtown from the mid 1800s through the 1970s. ZCMI grew into a large department store. Found on the the “gentile section” of Main Street were Paris Company, Broadway Music, Wolfes Sporting Goods, Kress’s, The Owl, Lambs Grill and Shipler Photography studio along with local jewelers. Prior to the completion of the Crossroads Mall, the city initiated the “brilliant idea”, from the suggestion of eastern city planners, to widen the sidewalks which they believed would send more pedestrians to the south end of Main. The sidewalk widening removed half of the on-street parking on Main and it proved to be a terrible decision for local businesses. Sidewalk construction left businesses with piles of dirt in front of their entrances for months. 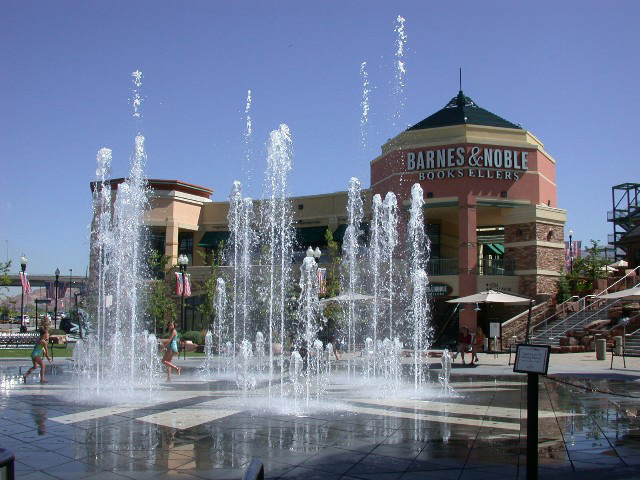 The double whammy was the completion of the Crossroads Mall which successfully shifted the retail nucleus from the Exchange Place Block to the ZCMI and Crossroads blocks. Exchange Place now had very little parking, and all was paid parking, compared with the malls which had plentiful parking and all free. The traditional “gentile” retail center of Salt Lake began to crack. Oregon-based Nordstrom replaced Salt Lake City’s own Auerbachs and Paris Company department stores. Wolf’s Sporting goods went under, and Bakers Shoes was eventually replaced by Foot Locker and Payless Shoes in the malls. Broadway Music, open for 50 years on Main Street sung the bitter tune of lost customers and eventual closure. About 30 shops went under on Exchange Place to be replaced with mostly corporate chains in the malls. In the place of local character and charm Main Street became desolate and the malls contained all the “life” of downtown. Some local businesses did thrive in Crossroads: Hammond Toys, Tinderbox, Tabula Rasa all survived for years. But unbeknownst to the locals several of the mall chain stores were receiving free or subsidized rent. Mall leasing agents have always favored corporate chains over the local businesses.